I've been playing around with the Mom & Dad Stockton's camera (Nikon D70), and was able to take some nice shots of the birds in the snow. I don't know how these little birds manage to stay warm in these freezing temperatures, but they seemed to be enjoying themselves, and looked so beautiful in the snow. Here's a look at the Sound with the snow clouds set in. Believe it or not, the water is behind those trees. Lindsey gave Dymphna a much needed bath. Dymphna's favorite part of the bathing process is being blow dryed. As I mentioned in my last post, we have been debating going to Oregon for Christmas. That was the plan, but we decided yesterday that it was too risky. Boy am I glad we stayed around town. Yesterday, I went to the mall with my parents to do some last minute Christmas shopping. While we were there, it started to snow. We came home and Andrew and I threw our necessities into the car. We made the journeyed across town to my parents' home, where we plan to stay through Christmas. They live in a decommissioned fire station in Manette. The view from here is amazing! Below are some pictures Andrew took from the living room window. Last night, we went to Mass and picked my brother up. When we got home we all decorated the Christmas tree. Up to this point, my parents did not have a tree because of our plans to be out of town. But now we have one up and decorated. December is going by amazingly fast. I guess that is what happens when you are really busy. Today was supposed to be the last day of school, but it was canceled due to the snow from yesterday and the icy roads. It's kind of nice to have an extended break, but I'm a little sad about not being able to say goodbye to my students and have closure before the break. Oh well, I guess January will be here soon enough and I'll be back in school. So now I find myself with a lot of time on my hands (the whole day), and I thought it would be a good time to update the family blog! At the beginning of the month, I came home from one of my night classes, and found my wonderful husband tidying up after hanging Christmas lights on our little house! I was so thrilled! He is very good to me. We had talked about putting lights up, but in the back of my mind, I doubted that we would get around to it. Coming home to this was delightful surprise and I have really been enjoying them all month long. I also bought a wreath for the door from one of my students doing a fundraiser. I think our house looks very Christmasy! Last weekend, we went up to Bellingham to witness the wedding of our good friends, Lauren and John. Their wedding was really beautiful and holy! For me, attending a wedding after being married is a lot different than before being married. As an unmarried person, I would often think of how I longed to be married. Now I think I can enjoy weddings a lot more. They serve as a renewal of my own commitments and love for Andrew. Lauren and John also had some great ideas for the reception. Here are a few I thought were particularly neat: Their favors were Christmas ornaments with their names on them. During the reception, they played Christmas music. The toast was done with hot cider spiked with rum (I couldn't have any, but I thought it was a cute idea). As they left the reception, all the guests got a jingle bell and we formed a jingly isle for the couple to run down. As they drove away in the car, the snow started to fall! It really was perfect. Lauren and John, we love you both and you will be in our prayers! After the wedding, we went home to Mom and Dad St.Hilaire's and decorated the tree with them. We had cut it down together that morning, and when we got back it was up and ready to be trimmed! During our dating relationship, this was an event I participated in every year. It has become a tradition I look forward to every year. I also look forward to our children being able to help out in the coming years. Baby St.Hilaire is getting really big. Last Wednesday, after we had the ultrasound, Andrew felt him move for the first time. We were at our Holy Hour and it felt like the little guy was doing aerobics! I grabbed Andrew's hand and placed it where I was feeling the movement. He smiled and nodded his head (we were trying to keep quiet in the church). Since that day, I have felt him move more and more. Just this morning, I told Andrew that I seem to feel him now even when he is just being still. These milestones keep us in awe of God's creation. We are so honored to be parents and we love our son so much! Here is the latest belly picture. After looking at it, I think I was slouching. But I was not trying to stick out my belly even more, I guess my posture is just going down hill! And finally, on to the snow! 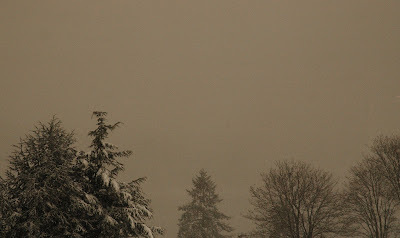 Yesterday, the snow came down, and down, and down. It snowed for almost 10 hours. I think we got a total of 4 inches at our house. We made a trip out to Safeway (a short walk from our house). I bought ingredients for some cookies I wanted to make. They all turned out delicious. I made Buckeye Balls (Andrew liked these the most), Chocolate Toffee Chrunchies (I liked these the most), and my mom's "Jingle-bell Fudge." This fudge is very easy to make and tastes oh-so-good! Just make sure you use condensed milk and not evaporated milk, like I did last night. Because of this mistake, the fudge did not harden. I put it in the freezer and that seemed to help. It turned out all right but could have been better, had I used the right ingredients. I really like cooking and baking, I just feel like I never have time and I don't have much experience. This cookie-baking day really put me in a good Christmas mood. After making cookies, Andrew and I watched Elf, one of our favorite Christmastime movies. Now we are waiting to see how the driving conditions will be today and tomorrow. We were supposed to go down to Newport, Oregon, with my parents, for Christmas. They have a house down there on the coast. But we are a little weary of the weather and getting stuck somewhere. We shall see what happens. I was really looking forward to going down to Oregon, but my focus on Christmas is to celebrate the Christ-child's birth, to be with my family and be safe, so I will be happy if we stay here too. Our house covered in snow! We hope everyone has a wonderful, holy, and safe Christmas! 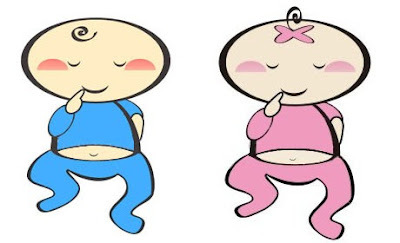 What an amazing experience to witness your child nestled in his or her (no mention of gender until you watch the video!) mother's womb. So fragile and delicate, yet unbelievably complex. As you'll see in the video, the heart has developed the chambers and valves, and has been beating since about 5 weeks (our baby is 17 weeks old), and as Lindsey pointed out to me today, will continue beating for the rest of his/her life! I was surprised even to realize the intricacy of the umbilical cord -- which comes from the baby, not the mother -- that has two arteries and a vein. When in awe of the beauty and mystery of creation, we must give due credit to the Creator. A funny aside: Poor Lindsey was told prior to the ultrasound that she needed to drink 64 oz of water. So our 15 minute drive to Silverdale was good practice for our run to the hospital come May 9thish, because Lindsey had to pee so bad it looked painful : ) When we got to the clinic, we went to check in at the front desk, and they didn't have Lindsey scheduled for an ultrasound appointment. We went through the whole spelling of our last name, which is notoriously tricky, and tried her maiden name as well, with no luck. Lindsey was about to wet herself. Fortunately, the receptionists figured out the mix up and told us we were really supposed to be at another clinic just a minute away. Well, when we got to the right clinic, and the ultrasound technician began his measurements, it turned out Lindsey had too much to drink and her bladder was squishing the baby, so he made her go to the bathroom, but only "halfway." Supposedly this is really hard for women? : ) So she gets back, partially relieved, and she's still too full, and has to use the bathroom again. About halfway through the video, you'll hear the technician asking if she'd like to go to the bathroom again, this time to let it all out! He insisted. So should you find yourself scheduled for an ultrasound and told to drink 64 oz of water beforehand, I'd recommend 20 to 30 oz instead. Tomorrow we will have some exciting news (hopefully)!! Bout time we got these up! We had a great couple of days in Bellingham with Mom & Dad St.Hilaire, which blew by. We began Thanksgiving day by giving thanks to Our Lord for his outpouring of love on the cross, by going to Mass at Sacred Heart. As we say at Mass, "It is right to give Him thanks and praise." At the Last Supper, on the night he was betrayed, our Savior instituted the Eucharistic sacrifice of his Body and Blood. This he did in order to perpetuate the sacrifice of the cross throughout the ages until he should come again, and so to entrust to his beloved Spouse, the Church, a memorial of his death and resurrection: a sacrament of love, a sign of unity, a bond of charity, a Paschal banquet 'in which Christ is consumed, the mind is filled with grace, and a pledge of future glory is given to us' (Catechism of the Catholic Church). Eucharist, derived from the Greek word Eukharisteo means "to thank," or "thanksgiving." We were so happy to see Fr. Qui-Thac again. After Mass, he came over to my parents house and visited. He's a man we are truly thankful for! Having gained 15 pounds in Bellingham, it was back to Bremerton for Thanksgiving and games with Mom, Dad & Aaron Stockton and Noah, who lives in one of the apartments at the Firehouse. Today, I found out that he and his brother will be biking for 2+ years in 25+ countries, some 25 thousand miles across the world for the cause of Life in India. They're calling it The Orphan Ride. They will be donating two years of their time, money and God-given strength and giving 100% of the proceeds to the orphanage. Pretty cool. Be sure to check out their website for more information, to follow their journey (beginning March 2009), and support their cause by donating, even if it's just a few dollars. Also, keep them in your prayers! Right now we are in Bellingham visiting with Mom and Dad St.Hilaire. We have had a truly wonderful time. We do not really get to see them very much and we miss them. My contribution to the feast yesterday was mashed potatoes. I used a recipe my mom used last year. They were delicious! I have so much to be thankful for! Today we journeyed out to the mall (at about noon- so everything good was gone). We went to Macy's to look for a few items. In the men's section we witnessed a man being very rude to a woman who was with him. From eavesdropping, I think the woman was his mother. I would guess he was in his 50s. Watching his rudeness put a pit in my stomach. He was terrible, and she just took it. I wanted to go over and scold him for treating her in such a terrible fashion. There is no reason for anyone to talk to another person that way (especially to your mother!). I kept seeing them around the store and I really wanted to say something. Sometimes the teacher in me blurts out behavioral corrections to strangers. At the checkout stand the mother said something to her son and he shushed her with a finger over his mouth and a condescending look in his eyes. She turned away and sat down. I couldn't believe it. I am SO thankful to have a husband who respects his mother and me. My mom always told me that you can tell the character of a man by how he treats his mother. I told Andrew how thankful I am for him. It is so great to be in a relationship based on love and selflessness. I am very aware of how selfless Andrew is in our marriage. He is always taking care of me. Most of all, I can see his compassion in his eyes every time he looks at me. I am very blessed and so thankful. I had to blog about this experience while it is still fresh (though I should be packing for Bellingham right now...). I was just at the bank and the teller asked, "Are you expecting?" I smiled and said "yes," but my thought was "Hm, that's weird. I wonder if it says that on my account." Then I naively asked, "can you tell just by looking at me?" She said, "Yea, it's pretty clear." There you have it--the first stranger to make a comment! I was kind of embarrassed and turned bright red (something that happens often lately). And then I got even more embarrassed for turning red, so I got even redder. She could tell I was uncomfortable and tried to make small talk... it was just a really awkward situation. And so begins the comments, and (from what I hear) belly pats from strangers. I am sure I will get use to it, but it is a little, well, embarrassing. Other than the baby sticking out a little more, did anyone notice that I shrunk a little??!?!?! Very crazy... maybe it's the shoes (I hope!). We just went on a double date with my parents yesterday to see the movie "Fireproof." It is truly amazing! We all left with "salty cheeks," as Andrew said. My cheeks were more than salty, I was sobbing during one scene. I don't think I have cried that hard in a movie since I saw the "Passion of Christ" for the first time but it could have something to do with me just being more emotional lately. For all the married couples out there, this is a perfect date movie. (And for all our unmarried friends, it is just a great movie- so go see it!). I think it really dug to the core of problems in marriages. Although Andrew and I are pretty new at this whole marriage business and do not really have the problems presented in the movie, I could definitely understand and relate to the movie's message, just because it's main message was "love is a choice." True love is not easy, sometimes it means we love people when they are not deserving, but just look at how much Christ loves us, and we are SO undeserving. We must approach marriage with the same spirit of dedication that Christ has in His love for us. Andrew and I went to our second doctor's appointment. We did switch doctors because of some pro-abortion vibes we were getting from our other doctor. As it turns out, one of my coworkers has a husband who works in the same clinic as our first doctor. He is Catholic and shares our values and beliefs. So this was our first appointment with him. He was really great. We heard the baby's heart beat (insert salty cheeks here). We only got to see the heart beat with our first ultrasound, so this was the first time hearing our baby. We heard the little tyke loud and clear! At our next appointment (December 10th) we will have another ultrasound and we will get to find out the gender of our baby. We have decided that we want to know. I figure, it will be a surprise either way... we will just be surprised a little earlier =) Andrew was talking to our friend Lauren about this and she also added that it is nice to be able to call the baby "him" or "her." The unborn are so dehumanized that it will be great to refer to them with a gender specific pronoun. Plus, then we can get going on figuring out a name! At this point, we really have no clue about names... and any names I suggest are apparently too "old-ladyish." I don't see what's so wrong with Esther or Agnes. As Andrew mentioned, baby and I are in our 14th week of pregnancy. I am beginning to feel sensations down there, instead of just feeling bloated. When I reach up to grab a dish from the cupboard and my belly presses against the counter, I feel some extra pressure. It is difficult to describe. It's not pain by any means, only a defense I think to alert me of pressure being placed on the baby. 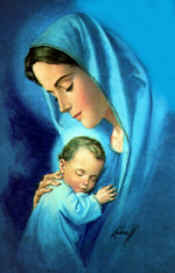 It is odd to think that baby St.Hilaire can feel pain that I can't. It could be that when there is pressure on the baby, they are being hurt or at least bothered. But I don't feel any of that, just an alert. I was observed yesterday in my teaching practicum. My supervisor is also pregnant, but she is due any week. Thus, I had to do an lesson yesterday and will have one next week because she is taking well-deserved time off when the baby comes. She said she is ready to get that baby out! I told her that will be nice, but will she miss having the baby inside? As a mother of one already, she said she did miss having her other daughter inside after she was born. I have been having crazy dreams (seems like every night) about the baby in one way or another. Either the baby has just come out and I am watching Andrew be a father, or I am watching other women give birth as part of a preparation class (weird, I know)... These dreams make me really anxious about the arrival of the baby. I just want to hold them. But I have also thought about how much I will miss the closeness that I am beginning to feel now with having the baby inside. With this child, this is the closest I will ever be. It kind of makes me sad to think that I will never be as close and that they will grow up and leave me (sounds like something my mom would say! [love you, mom!]). I especially fear that any of my children may leave their faith. As a teacher, I currently have that fear for all of my students, but it is greatly intensified when I think of my children. I know how special they are, and how much Our Lord loves them. It would pain me to have children reject or deny that love. Listen to me, the baby isn't even out and I am already a worry-wart! I just know that although I am eager to hold and nurture my child, I should savor this special closeness that I have with them right now. Halloween came and passed this year in the blink of an eye for Lindsey and me. Rest assured, we were inundated with Halloween costumes, decorations and candy just about everywhere we went, but since we chose not to celebrate the secular holiday in the "traditional" manner, the day went by like any other as we looked forward to All Saints Day and All Souls Day, feasts celebrated by the Church the first two days of November. Lindsey and I were, however, looking forward to cheap pumpkins and candy following Halloween. We were going to make soup and pie out of the pumpkins and the candy... well, the candy needs no explanation. When Lindsey went to the store two days after, she was disappointed to find no Halloween candy or pumpkins in site, but instead fake Christmas trees and decorations! It's too bad the birthday celebration of the Son of God has become one of the most exploited holidays by our consumer society. Year after year, our attention is largely diverted from the Incarnation to materialism. On a separate note, Lindsey is now a week into the second trimester and is beginning to show! We're growing with anticipation for the day in which we can greet and hold our child. Each night as we go to bed, I like to reach my arm around Lindsey's womb and pray for our baby. Just a week ago, the thought came across that already I have a child whom I love unconditionally. Amazing. Lindsey has been doing well. She continues to feel nauseous at times and is looking forward to the day that's over with. Her endurance and positive outlook is something I admire daily. Lindsey is one of the hardest working people I know. She is one who embraces challenges and whose life is complete with selflessness. It's something I learned about Lindsey not long after we met over 3 years ago, and as God has designed marriage as a sacrament, or "sign", that points heavenward, I've witnessed how Lindsey is Christ to me and to others. I am humbled to be her husband and am looking forward to see my wife grow into the role of motherhood, something, I'm certain, will come naturally for her. Where is Baby St.Hilaire in the Ultrasound?? Hello everyone! We have some wonderful news to share with you. I am pregnant! The baby is about ten weeks old now and is due on May 9th. We have known for a couple of months, but are just now sharing the news. We went to our first doctor's appointment on the 13th and got to see an ultrasound. We saw the baby's heart beat and the little guy or girl wiggling around. I have been feeling alright so far. My stomach is often upset though. I have a really sensitive gag-reflex too. Brushing my teeth is the worst time for this. I have thrown up two times so far (which I detest). Most of the time when I feel like I could throw up, I just try to walk around or drink some water and the feeling will go away. Other than that, everything is great! We would really appreciate your prayers for our little one. So please pass the word around to all you know. God bless! "Awe, we've been married two months!" School is going well. I have been very busy juggling many tasks. I honestly look back at each day and don't know how I got through it. This coming week will be especially busy because it is midterm for my students, which mainly means more work for me... Please keep me in your prayers. This morning our power went out. It was really weird because we looked outside and it was sunny. I guess the electricity people were working on something... Anyway, Andrew and I realized that all the things we rely on do not work with out electricity. This was not a shock, but it really made me thing that we should have some supplies for emergencies. For example, I told Andrew we should get a portable radio so we are able to hear the news. We are right next to Safeway, so we would not be short on food. This power-outage (along with the cold weather) also created a longing in me for a fireplace or wood stove. I am very excited to live with Andrew in our own home someday, where we can dream up and have whatever we want; but I am very thankful for the house we are renting now. It really is perfect for us at this point in our life. 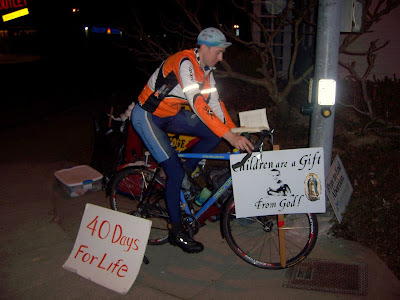 Andrew has been going to Seattle every Tuesday and Thursday to help out with the Seattle forty-days-for-life. He is taking advantage of the down-time God has gifted him, but soon he will need to find a job (prayers for that are appreciated too!). Nevertheless, I am very proud of him for making that trip two days a week. Well, that is all the news I have! These are pictures mainly taken by Dad St.Hilaire and a few by me from that crazy weekend over a month ago! School began a few weeks ago. The year is off to a good start. I am really enjoying having one year of experience under my belt. Everyone told me the second year would be easier, and I think it is true. Of course there are new challenges, but I leave school each day with excitement for the next (but I do really enjoy the weekends!). On Friday, I took my 6th grade homeroom to pray a decade of the Rosary in the church. We wanted to pray a whole Rosary, but were running short on time. I asked them if they would like to pray the whole Rosary in the classroom, or pray a decade in the church (walking to and from places takes a long time!). They all agreed that they would prefer to go to the church. I was pleased with their decision and told them that making a visit to Christ in the Blessed Sacrament was very pleasing to God. So we all headed over to the church and knelt down in front of the altar- all 30 of us! It was so beautiful. There were a few prishoners praying in the church at the same time, and I am sure it was good for them to see all of the pre-teens bring their hopes and prayers to Our Lord. I think it is very inspiring to see young people stiving for holiness. It is good for me to pray with my students because sometimes being a teacher can be frustrating and trying on one's patience. Praying with them enables me to see them as children of God and reminds me how much Our Lord deeply loves each of them. Right now, Andrew and I are in Bellingham visiting with Mom and Dad St.Hilaire, Lou and Jenna (our brother and sister), and our friends from the Newman Center. We wanted to "get away" this weekend because I will begin taking night classes on Monday. Needless to say, I will be very busy and tired until... April. I am anxious about having so many commitments, but I know this will be short-lived and Our Lord will give me the strength to do well in what he has called me to do. After our wedding, Andrew began growing his facial hair out. I think this was rooted in a couple days of laziness, but I told him that I really liked it (truly!) and I encouraged him to keep growing it out. He had not really tried growing his beard out before and he quickly began commenting on how itchy it was becoming. Before: doesn't he look good?!! I think he looks like Wolverine from X-Men in this one. And here begins the adventures of Patch-man!!! Patch-man likes to delve into deep contemplation. Patch-man, don't catch your patch on fire! Patch-man and the Pope are tight. Patch-man spends much time surfing on the web. Patch-man, what is Dymphna saying to you?